If you have bad breath, you may be the last person to know it. It’s a very touchy subject, and even your best friend will not tell you. Unfortunately, if you are the victim of bad breath you may not be able to tell on your own. That’s why it’s a good idea to practice good oral hygiene habits to avoid getting bad breath in the first place. 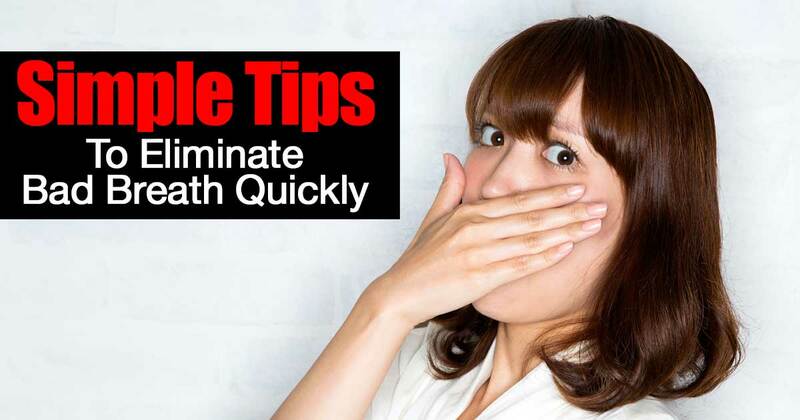 Here are some smart, natural steps you can take to eliminate bad breath. One of the simplest things you can do to avoid having bad breath is to brush your teeth at least twice a day , floss daily and see your dentist regularly. You should also take extra care to eliminate odors from strong foods such as garlic and onion. You should not avoid garlic and onion because they are good for your overall health; however, when you eat a meal that contains strong smelling foods such as these, it’s a good idea to follow it up with some parsley or to simply rinse your mouth and/or brush your teeth. Being aware of your oral hygiene can go a long way toward combating bad breath. Grain products and starchy processed foods turn to sugar in your system very quickly. This is bad for your overall health, and it creates an environment that is conducive to yeast and Candida overgrowth. These culprits can wreak havoc with your health and cause very bad breath. For this reason, it’s a good idea to completely avoid all processed foods and sugar and to sharply curtail your intake of grains. Generally speaking, a grain and sugar-free diet is the healthiest diet for a human being. Strive to eat foods that are high in protein, rich in fiber and that provide plenty of healthy fats. You should also include probiotic foods such as yogurt in your daily diet. Alkalizing foods are also excellent for fighting off candida and yeast overgrowth. Probiotics are healthy fauna that live in your mouth, stomach and intestines. They fight off yeast and candida and help you digest your food properly. Some of the best foods you can eat to get a healthy dose of probiotics include homemade yogurt that has been fermented for a full day (24 to 29 hours). Kefir made from coconut milk or goat’s milk is also an excellent source of probiotics. Other sources include fermented vegetables such as sauerkraut and kimchi. If you include plenty of these healthful foods in your diet, you are unlikely to have bad breath. What Are Healthy Oils And How Do They Work? For many years, we have been told that we should eliminate oil from the diet. This was a big fad toward the end of the 20th century. It was fueled by the misconception that food doesn’t make you fat, fat makes you fat! This notion is patently untrue, and if you still believe it you should stop. Today we know that we need healthy fats such as coconut oil, olive oil, flax seed oil, walnut oil, sunflower oil and various other organic oils to support proper function of the central nervous system and a wide variety of other important bodily functions. Of these, coconut oil is the best all around choice. It is readily available, affordable and extremely versatile. Coconut oil provides lauric acid, caprylic acid and medium chain fatty acids. These fatty acids have powerful antimicrobial properties. For this reason, including one or 2 tablespoons of coconut oil in your daily diet will not only improve your overall health, it will also help eliminate bad breath. Many people believe that it’s necessary to eliminate all bacteria from the mouth in order to eliminate bad breath. As we have seen, there are friendly bacteria (probiotics) that are necessary in order to have fresh breath. For this reason, the last thing you want to do to freshen your breath is use a strong mouthwash. Commercially made mouthwash containing alcohol and harsh chemicals will kill off all of the bacteria in your mouth and cause an imbalance which will ultimately result in chronic bad breath. Instead of strong, chemical laden commercial mouthwash try using peppermint oil. You can create a mild mouthwash by adding a dozen drops of peppermint essential oil to a cup of pure, filtered water. Keep your mixture in a tightly sealed bottle or jar and use as mouthwash whenever you want. You can also carry a vial of peppermint essential oil with you and put a drop or two on your tongue from time to time to help freshen your breath. Green leafy vegetables are rich in chlorophyll, which is a natural deodorant. Be sure to eat plenty of fresh greens every day and include fresh parsley in salads and other dishes. Revive the old-fashioned habit of chewing on a few leaves of fresh parsley after every meal to freshen your breath and give yourself a boost of chlorophyll. Other foods that are rich in chlorophyll include celery, cucumber and other green vegetables. Just remember that any veggie that is green is bound to be filled with chlorophyll. When you take good care of your overall general health and practice good oral hygiene habits, you can count on having fresh breath. Follow the advice presented here to have a healthy mouth and sweet breath.